When I decided to take the GRE I was a bit overwhelmed with the amount of material that was available everywhere. I was pretty confused about how I could work out a preparation plan that would be comprehensive but at the same time be efficient and manageable with a 9-6 job. Round about this time I was told about BrightLink Prep by a friend who added me to their Facebook page. I read a lot of the articles on the associated blog and it was pretty obvious that they knew their stuff. I registered for the course about a month before it started and it proved to be a prudent decision. It was exactly what I was looking for. Talha bhai had compiled all the best resources that were available as notes, assignments, and quizzes which were given every week and were extremely comprehensive. Sifting through all the available material and preparing all of it alone would have taken me considerably longer than the 2 months for which I attended the course. Another crucial resource provided, the importance of which I was oblivious to, was the 12 online and 4 paper tests. I did them in the last 3 weeks leading up to the exam and they were extremely important as they helped build stamina and gave diagnostics for targeted practice. Talha bhai is a great teacher who caters to his students individually. I remember having some problems with probability for which he separately gave me some material to study and practice which helped my preparation a lot. With BrightLink you will have access to the best study material and plan. All you have to do is diligently execute the plan and the results will follow. I’ve listed some tips I learned along the way which will hopefully help you out in your prep. For vocabulary, I learned the 1100 words from the Magoosh app and revised regularly. To remember words, I usually had google open in a tab on which I searched up the words and played their pronunciation. This along with coming up with stories and sentences and using them regularly helped me retain the words. I learned about 50 words per day from the Magoosh app – so it took me around 20 days to learn them all – and then kept on revising on weekends. That was a wise decision since when I revised the first time I discovered I had forgotten half of the words I’d learned the first time around. For short and long passages I read the question – but not the answer choices – first and then came back to the passage. That way while reading the passage I knew what I was looking for. Come up with an answer before reading the answer choices. This helps save time. If you can’t find it start eliminating choices one by one till you get one that makes the most sense. Try to personalize and understand the arguments and passages. I sometimes translated them into Urdu in my head to better understand. This works wonders if English isn’t your first language. In long passages, if the question stem says something like “in the first paragraph” I read the first paragraph only to answer the question. Reading the rest of the passage before answering sometimes caused me confusion, especially in the long passages where I’d typically forget the fine details of the first paragraph. Try to understand everything conceptually. The GRE is a test which checks how strongly you understand different relationships and tests you on them. Since the test makers are restricted by the limited subject content, they make the questions difficult by employing little tricks in the questions, or for more harder questions, a combination of tricks (e.g. 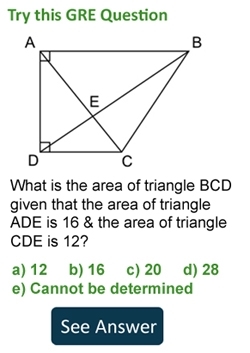 recognizing a 30-60-90 triangle, applying an algebraic identity (a+b)2, etc). But as hard as they might get there’s only a finite amount of tricks they can play. Do lots and lots of practice so that you can recognize them like the back of your hand. Do lots of timed practice. I think given enough time anyone can solve the toughest of GRE questions. The hardest part is doing 20 questions in 35 mins. Mock tests should also help with this. Analyze your performance on mocks and use this for targeted practice. While studying for the GRE is an arduous task, taking it is a different ball game altogether. I strongly recommend that you do as many timed mocks as you can before taking the test. This helps build up stamina and will help you figure out time management techniques which are paramount if you want to score highly. The Manhattan, Princeton, Kaplan and ETS mocks are pretty good in this regard. For the verbal sections, I spent the first 5-8 mins on Text Completions/Sentence Equivalences, followed by 10 mins on the short passages. I left the long passages for last as they were the most time-consuming. On the quant section leave the data interpretation for the last 10 minutes. Get the rest of the questions done in the first 25 mins unless you encounter a particularly nasty question. In that case, spend a maximum of 40 seconds on a question. If you don’t have a credible approach to the question in 40 seconds, mark it and move on. Come back to it after you’ve done the data interpretation. Re-reading it after 20 mins may give you a fresh perspective on the question. For both sections, read the questions VERY carefully. Sometimes you make casual mistakes just cause you didn’t read the question closely enough. On your scrap paperwork neatly so that if you have to come back to the question you can easily pick up where you left off. Moreover, if you’re prone to making casual calculation mistakes like me don’t miss out on any steps in your working. Writing it all down reduces chances of unforced errors. I highly recommend you go take a mock test at your Prometric center a few days before the test. Acquaint yourself with the environment and plan out your schedule and breaks. This helps from your nerves acting up on test day. In Islamabad, it’s pretty cheap and cost Rs. 500/-. If your center offers mock exams definitely go for one. I’m not sure about this one, but I think that in addition to the60-second break you have between sections, you can leave the test hall when the instructions for the test are displayed. If that’s the case feel free to take a break during that time as well. As long as you know what the instructions are, it shouldn’t be a problem. I did a lot of mocks and by the end I think I knew the instructions by heart. Take along instant energy eatables like chocolates etc to keep yourself alert throughout the test (I saw a Glaxose-D box in the fridge when I went lol :p). The 4 hour test really enervates you and by the end of the 5th section you can get pretty tired. Take it easy on the day before the test and get a good nights sleep the day before. You need your mind at 100% for the array of confusing questions the test is going to throw your way. Have a good breakfast and plan to reach the test center atleast 45 mins before the exam. Pray to God that the you’re research section is the last one! Other than that, don’t pay any attention to where it could or should be. It’ll only distract you from the rest of the test. Finally, don’t stress out about the test. It doesn’t help and is only detrimental to your performance. Be confident in your preparation and you’ll do well! You will have access to the best prep material from a vast array of resources. Make sure you do all the assignments and quizzes regularly and try not to build up any backlog since it can become inundating. Talha bhai knows the GRE inside out and monitors his students individually. If you’re weak in any particular area ask him for extra help. The maestro won’t disappoint! You will have access to lots of mocks, DO them VERY seriously and DON’T skip out on any sections, not even the AWA. Though I’ve tried to elucidate on how to prepare for and approach the GRE, I don’t think there is a universal approach to it. Read about different test takers experiences and figure out what works best for you! In that regard, I hope this helped you along the way. (go to reddits gre forum and read experiences there as well. It’s full of 340/6.0 people). Finally, a shout-out to Talha bhai and the rest of the BrightLink guys for all their help. Couldn’t have done it without you! i’m very thankful to all of you guys you have done very well. After reading your experience i have got motivation God bless you!!! I am Aveenash from Karachi. Kindly also add me to your GRE platform. Should we take more than one mock test administrated by USEFP or do they have the same content each time and taking it once should be enough? hey .. This is Sumaira. I would like you to Add me to your GRE Platform.